While I'm not actually that fond of marshmallows on their own, I do like them in the form of a s'more. I suppose it's the memories of camping with my family that their toasted crisp shell and soft pillowy centers evoke when I eat them. Camping was about the only "vacation" my family could ever afford, and now I feel like I camped enough during my childhood to make up for my lack of interest in camping now. There's a brief window in the spring or fall, when the nights are neither too hot nor too cold to make sleeping on the ground somewhat bearable, but ideal weather aside, camping is not my favorite thing to do. 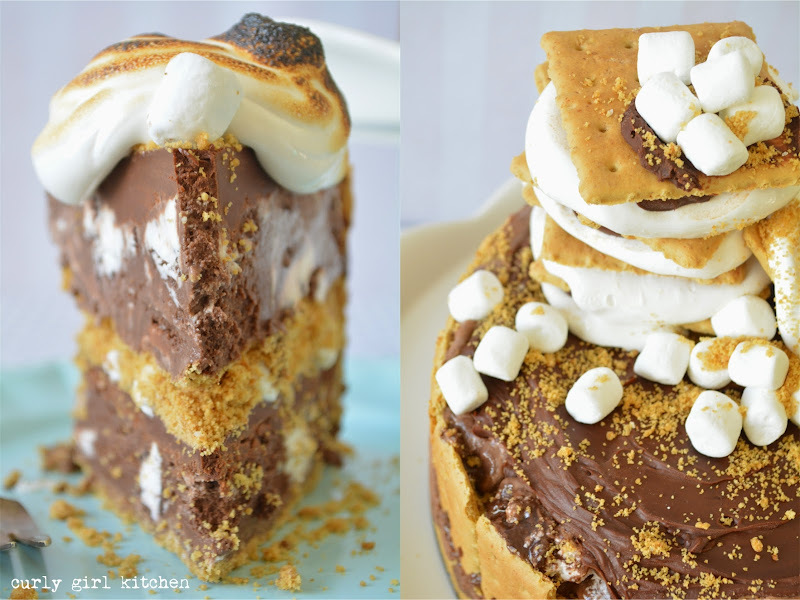 Still, though, I do love the taste of food cooked over a campfire, followed by mouthfuls of golden brown marshmallows, perfectly toasted over hot coals. I've had this s'mores ice cream cake planned for a while, although originally I had thought of making it for my own birthday this summer. But with some of the work completed on the house, we invited a few friends over for dinner on Saturday night, and I thought nothing would do but ice cream cake for dessert. I slow cooked baby back ribs, seasoned with a blend of spices for a dry rub, finished on the grill and brushed with my homemade barbeque sauce. There were creamy garlic mashed potatoes, and cold bean salad, sharp with vinegar to balance all the rich food. And homemade biscuits with honey butter. 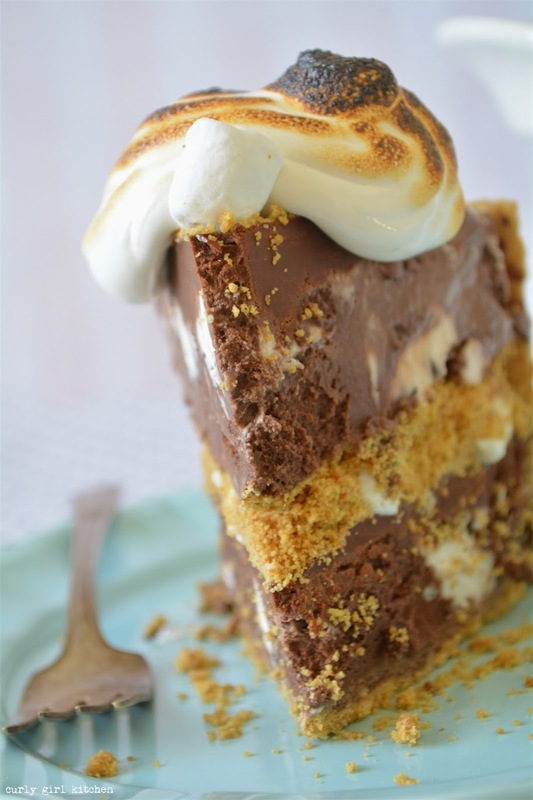 This ice cream cake has everything I want in dessert - sweet and salty, crunchy and creamy, decadent and tempting. 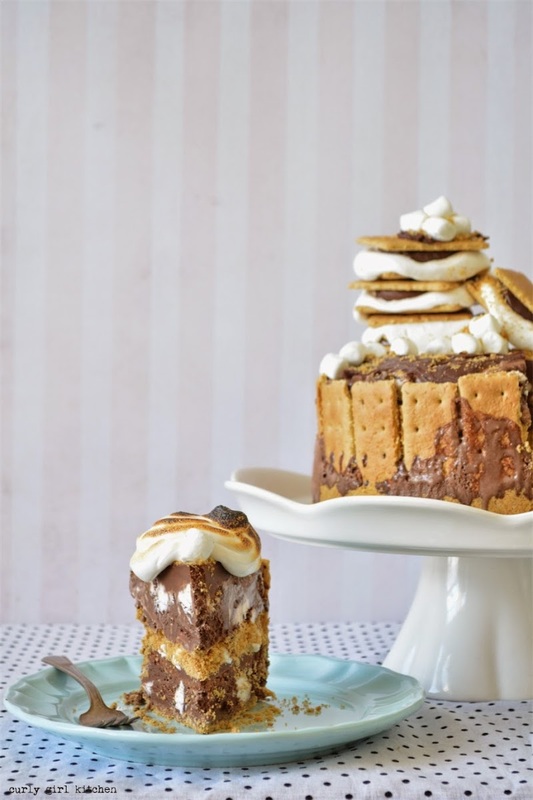 Buttered, salted graham crackers are layered with chocolate ice cream, bittersweet chocolate ganache and marshmallows, topped with scandent stacks of s'mores for a dramatic garnish. 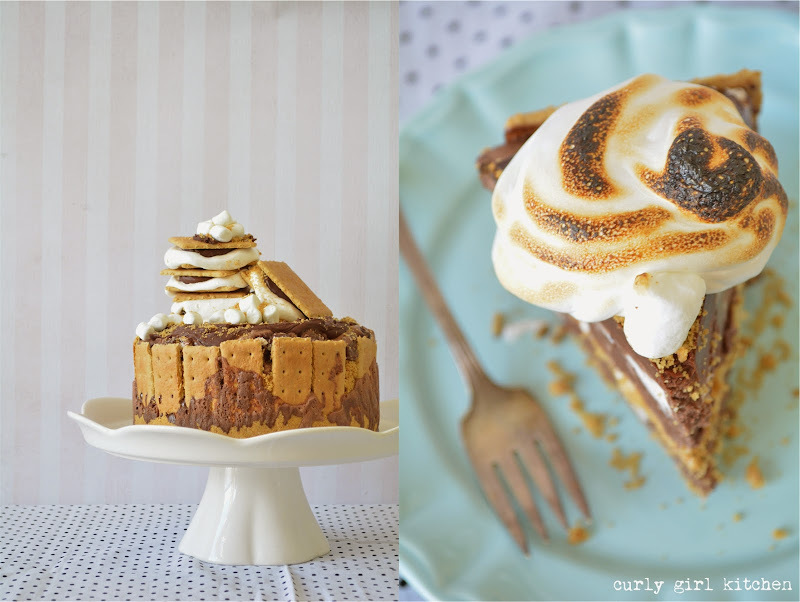 Just before serving, I spooned marshmallow cream onto each slice and toasted the cream with a brulee torch so the house was filled with the scent of s'mores. After dinner, and too much wine, our stomachs almost-but-not-quite-too-full of barbeque, we ate ice cream cake, and talked and laughed about anything and everything. Make the ganache first so it can cool. Finely chop the chocolate and place in a bowl. Warm the cream over medium low heat, just until it simmers around the edges. Remove the cream from the heat, pour over the chocolate and let stand for three minutes, then stir with a spatula until smooth. Let stand at room temperature for about an hour, until cooled and slightly thickened, but still spreadable. 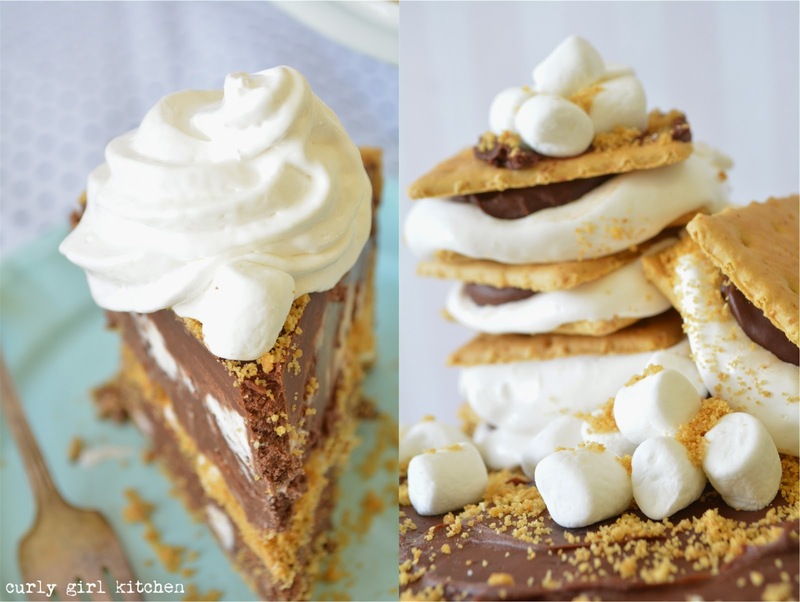 Take several graham crackers and make s'mores with a spoonful of marshmallow cream and some ganache between each. Place in the freezer; these are to garnish the cake. In a food processor, crush enough graham crackers to make 2 cups of fine crumbs. Combine with the salt. Melt the butter, and drizzle over the crumbs; toss with a fork to combine. Set out the ice cream to soften slightly. Working quickly, line a spring form pan with removable sides with parchment paper around the sides of the pan. Take half the graham cracker crumbs and press firmly against the bottom of the pan. Place graham crackers halves standing up on the crumbs around the sides of the pan. Spoon half the ice cream onto the crumbs and spread out to the edge, arranging the whole graham crackers to stand up again if they fall down. Top the ice cream with half the ganache. Sprinkle with a handful of mini marshmallows. Repeat with another layer of the rest of the graham cracker crumbs (reserving a few to garnish the top), ice cream and ganache. 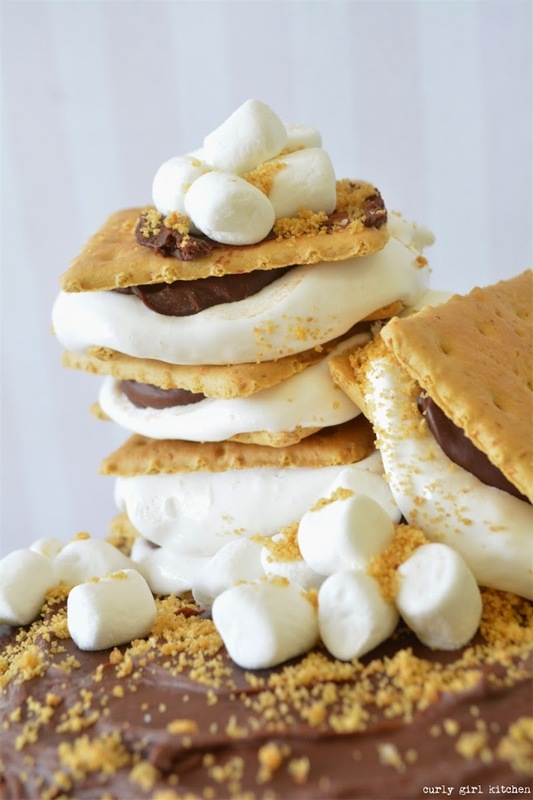 Top with the s'mores and garnish with a few more crumbs and marshmallows. Freeze overnight. 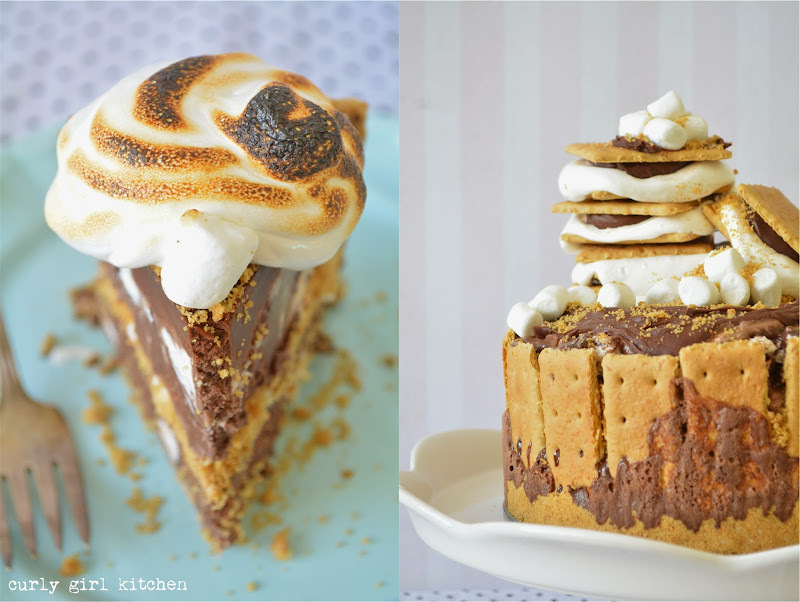 To serve, top each slice with a spoonful of marshmallow cream, torched with a brulee torch.